Tax Refund Options: Which Will You Choose? 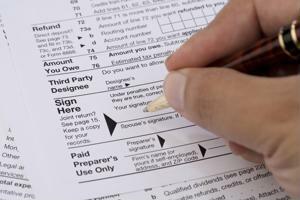 The process of filing income taxes can be stressful and tedious for many Americans, but a large number look forward to receiving a large tax refund from Uncle Sam when it's all said and done. The quickness in which taxpayers receive their refunds depends on a several factors, ranging from how they filed their taxes to whether any processing delays or mistakes occurred. For example, those who submit their tax forms electronically are likely to obtain their refunds more quickly than paper filers. In addition to knowing which factors will affect when they obtain money from the IRS, individuals may also be curious as to their different refund options. Gone are the days when taxpayers only had the choice of receiving a refund check from the government. Now, there are several ways Americans can obtain what they're owed. The first option is a standard check. Those who file paper returns may request that their refund be sent in the mail via check. However, this process can take longer and it make take roughly six weeks after their tax returns are processed for filers to obtain their refunds. Electronic filers may also request that their refunds be sent via check, and they typically wait up to three weeks. Though this process takes longer, there are some benefits to requesting a paper check. Unlike refunds that are directly deposited into wrong accounts due to incorrect routing and account numbers, paper checks that are lost in the mail are granted better protection. Another more popular option is to have a refund directly deposited into taxpayers' accounts. Individuals may also choose to have their refund deposited into multiple bank accounts. The IRS will allow refunds to be deposited in up to three accounts, such as checking, savings and retirement funds. Taxpayers can fill out Form 8888 to specify the accounts in which their money is to be deposited, and the process is much more expedient than obtaining a paper check. However, it's important that taxpayers ensure they fill out account information correctly. Failing to do so may result in them losing their refunds altogether. Individuals may also use all or a portion of their refunds to purchase U.S. Series I Savings Bonds. These investments can be purchased in multiples of $50, and individuals may purchase up to $5,000 in paper bonds in a given calendar year. Further, individuals have the option of purchasing these bonds as gifts for others, including spouses, children and grandchildren. For more information about the rules relating to bonds, individuals should consult their tax preparer when filing their returns.